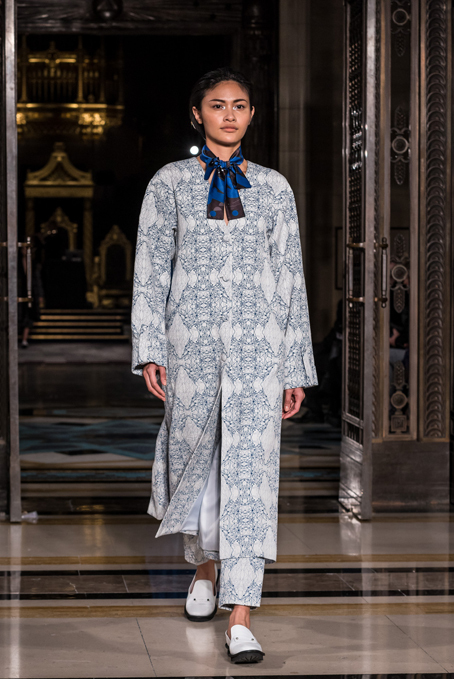 The APU JAN AW18 collection was, as to be expected, a glorious display of texture and fabric. Rich, seasonal hues of maroon and purple were combined with brighter, cooler blue tones, and monochromatic greys, blacks, and creams appeared throughout to tie the collection together. Clothing was a mixture of heavy and light, with layered ruffles and soft knitwear showcased alongside flowing organza and sporty silhouettes. 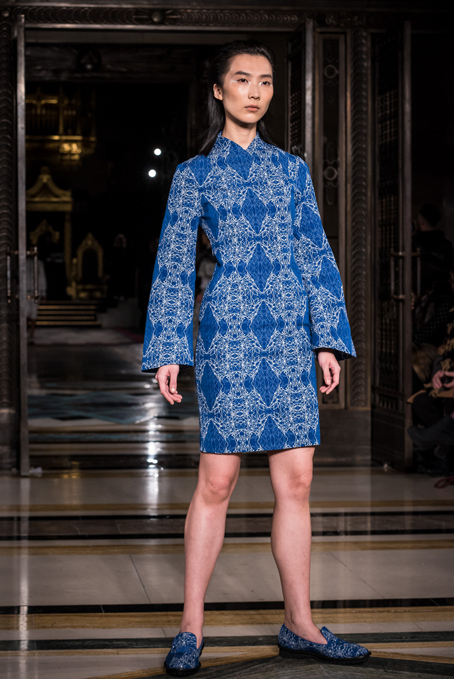 As per the brand’s established mission statement, we once again found traditional Eastern influences with a modern twist, shown through an offering of glamorous gowns and a selection of more casual pieces. This season, APU JAN’s runway was enhanced by live music, which was provided by DJ QuestionMark. A talented music producer and flautist in his own right, he was also accompanied by a pianist, a guitarist, and a double bass player, all of whom helped transform the fashion show into a mesmerising performance piece. Estonian knitwear designer Kristel Kuslapuu presented her AW18 collection as one of the winners of ‘Ones To Watch’. Inspired by darker themes than most, this season was all about secrets, phobias, social anxieties, and traumas explored in an ironically cheerful way. 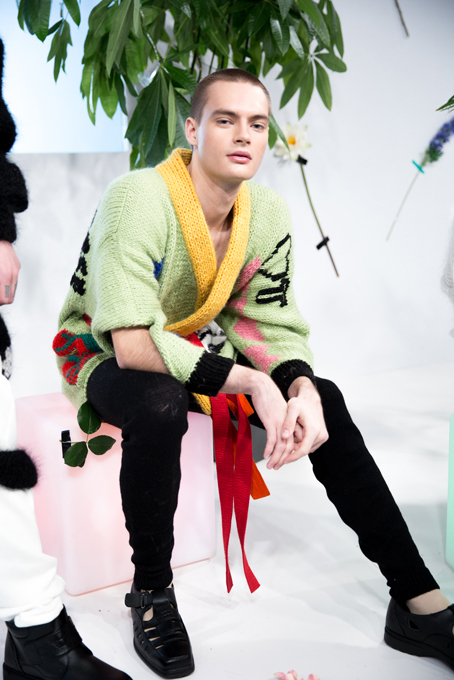 The designs were bold and colourful, with sculptural forms and interesting patterns having been crafted out of soft and fuzzy alpaca, camel, goat, and sheep yarn. Most of the pieces have also been hand knit as a strong protest against the ever-growing beast of fast fashion. With a mix of male and female models, it’s evident that Kristel Kuslapuu’s clothing transcends traditional gender boundaries; she’s perhaps suggesting that these difficult stressors exist within us all. In terms of set, the presentation space was decorated with foliage and flowers, giving us the idea of connectivity with Mother Earth, a theme in line with the beautifully organic nature of this collection.